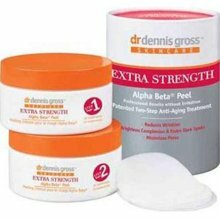 I am blogging to you guys as I literally have Dr. Dennis Grossman Extra Strength Alpha Beta Peel, Step 1, on at the current moment. This two-step peel comes in easy to use little attached packets. There is a small toewlette inside that you rub in circular motions all over your face (avoiding eyes) and as I learned avoid your lips because it burns and then let the peel sit for two minutes. As I type I feel the peel tingling and slowly subsiding. As I am waiting, I am reading their site which says that this product is said to minimize pores, improve skin tone and diminish wrinkles. According to the site it is like getting a professional peel in at home with less irritation. Also on their site it reports that it addresses problematic skin by helping to control excess oil, that the gentle microexfoliation helps improve clarity and dullness and additionally it instantly firms. Also they have some pretty impressive before and after pictures. Ok on to step two neutralizes the peel but also has in added beauty boosters such as green tea, vitamins A,C and E and Reversatol just to name a few. Well I just finished taking off step two and I can say my skin looks and feels nice and is not the least bit red, peeling, raw or any of those side effects that can come with professional in-office peels. My skin feels a bit firmer and looks less dull. My pores and lines seem a touch better but its only the first time so I am not expecting a miracle here. One thing I do wish is that the directions on the packet explained a bit more. For example, I have no clue how many times a week I am suppose to use this two-step peel. Additionally, besides avoiding any products with alcohol that it says it does not tell me if I should go about my normal toner, serum, moisturizer routine. I went online and it says I should follow with moisturizer but does not say anything more. I am going to go ahead and actually use his next product, the Alpha Beta Glow Pads next. Again, I am a bit disappointed in the lack of directions. I Googled it online and a review said to use the extra strength alpha beta peel followed by the alpha beta glow pads. I don’t know seems like a bit of Alpha Beta overkill to me but hey I’m just the tester. So anyways the glow pads are in the same type packet and little towelettes as the peel was. I must say for people that travel a lot like myself I like these little packets, they seem much more convenient then bottles that usually leak all over the place when you travel. The Glow Pad directions are the same as the peel to simply rub the towelette in circular motions and increase the number of repetitions to get a darker glow. The packet has a faint sunless tanner smell but nothing near and bad as half the stuff I have tried. I have it on my face now and do not notice the smell at all which is a plus. A con though is that the sunless tanner towel is clear so it’s hard to judge how much is where. I rubbed it every in circular motions and then went over for a second coat but again I wish it was tinged so I could see if I had missed a spot. So far I have had the product on for ten minutes and I notice a faint glow but not a tan. It does look nice and radiant but not tan per say. I think next time I will rub it all on until the towel is dried out and see if that adds a darker color. I will also report back later and let you know if it made me break out. I to date have not been able to find a face tanner that does not make me break out so I am hoping that this one works because it has the Alpha Beta Acids in it. Ok well I woke up this morning and WOW I am tan, a little to much so, opps. My skin looks really nice, firm and radiant. However, I am a touch darker in some areas where I must have went over the spot more then two times. I washed my face with my Clarisonic (which I review on here and LOVE) and the splotches went away. I will continue to use this product but the next time I won’t use as much tanner because I seem a little too dark, a hint on the orange side but nothing too bad. Ok last time I am reporting back on this product, I had a few breakout spots on day two. Nothing as much as I usually get from using self-tanner on my face but still a few. Bottom Line: I will buy the Alpha-Beta Peel pads again and I am going to try to glow pads again but am still a bit on the fence on this one. Finally, on a side note I really like that at Sephora I could purchase five two-step peel packets for $18 and ten Glow Pad face tanners for $15. I like that I was able to try these products before committing to the full size. Bottom Line: A noticeable difference after just one use. I will continue use these products.